When EasyDose is started, the operator is greeted by the splash screen followed by the LogOn Form. The user name can be selected from the drop down list or the user name can be selected by typing the first letter of their name which will open the drop down list and take the curser to a position in the list equivalent to the letter typed. NOTE: A standard requirement by most Health Departments is that a User’s password will need to be changed every 3 months with a restriction on using the same password within 24 months. The password for ALL people initially added to EasyDose is set to ‘password.’ When a user logs on for the first time, they will be required to change their password to something unique. Note, the password field is case sensitive and requires a minimum of 6 alpha-numeric characters. If you have a Fingerprint Reader and the user has their fingerprints register within EasyDose, simply scan one of the registered fingers when the LogOn screen is active and EasyDose will log that person in and take them to the appropriate form(s). 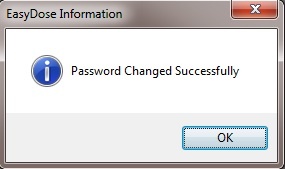 A successful password change will be confirmed. 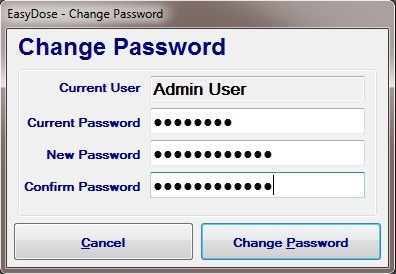 A password change can also be effected at any time from the Main Menu > Users > Change Password. The ability to change user on the fly is provided from the drop down menus on the main menu or from true quick access menu. The log on form will be presented to allow a user to change. The new user must log-in using the same process as described above. Further, if a user is to dose a client and they are not the logged in user, then by simply continuing to dose the patient will allow the user to change on the fly. This will occur at the verification stage when the user enters their User Name and Password. The new user will also have their details listed as the dosing pharmacist. If you have a Fingerprint Reader and the user has their fingerprints register within EasyDose, simply scan one of the registered fingers when he LogOn screen is active and EasyDose will log that person in.